Impaired swallowing involves more time and effort to transfer food or liquid from the mouth to the stomach. It occurs when the muscles and nerves that help move food through the throat and esophagus are not working right. It can be a temporary or permanent complication that can be fatal. Aspiration of food or fluid can also occur possibly brought about by a structural problem, interruption or dysfunction of neural pathways, decreased strength or excursion of muscles involved in mastication, facial paralysis, or perceptual impairment. The swallowing muscles can become weak with age or inactivity. It is a common complaint among older adults, in those individuals who have had a stroke, suffered head trauma, have head or neck cancer, or experience progressive neurological diseases as of multiple sclerosis, amyotrophic lateral sclerosis, and Parkinson’s disease. Dysphagia can befall at any age, but it’s more prevalent in older adults. Dysphagia can befall at any age, but it’s more prevalent in older adults. The causes of swallowing problems vary, and treatment depends on the cause. Patient displays ability to safety swallow, as evidenced by absence of aspiration, no evidence of coughing or choking during eating/drinking, no stasis of food in oral cavity after eating, ability to ingest foods/fluids. Patient and caregiver verbalize emergency measures to be enacted should choking occur. Patient verbalizes appropriate maneuvers to prevent choking and aspiration: positioning during eating, type of food tolerated, and safe environment. 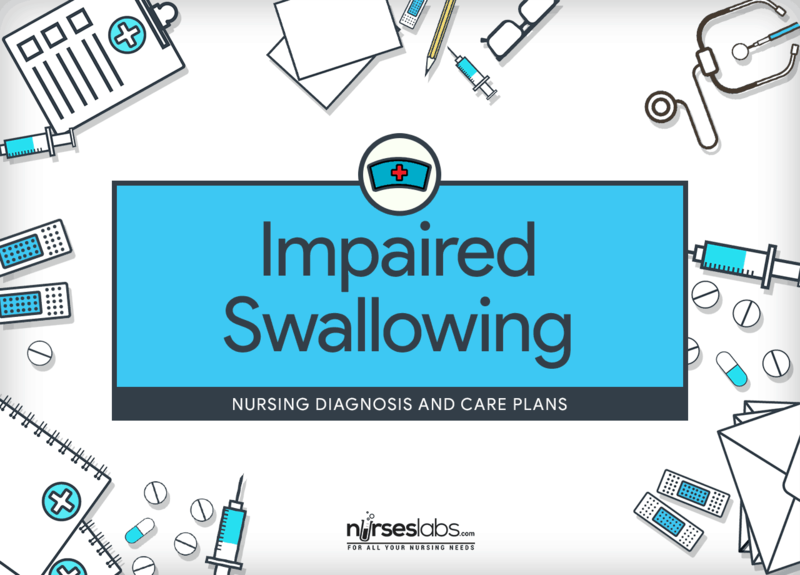 Assessment is necessary to determine potential problems that may have lead to Impaired Swallowing as well as handle any difficulty that may appear during nursing care. Assess ability to swallow by positioning examiner’s thumb and index finger on patient’s laryngeal protuberance. Ask patient to swallow; feel larynx elevate. Ask patient to cough; test for a gag reflex on both sides of posterior pharyngeal wall (lingual surface) with a tongue blade. Do not rely on presence of gag reflex to determine when to feed. The lungs are usually protected against aspiration by reflexes as cough or gag. When reflexes are depressed, the patient is at increased risk for aspiration. Evaluate the strength of facial muscles. Cranial nerves VII, IX, X, and XII control motor function in the mouth and pharynx. Coordinated function of muscles innervated by these nerves is necessary to move a bolus of food from the mouth to the posterior pharynx for controlled swallowing. Check for coughing or choking during eating and drinking. These signs indicate aspiration. Observe for signs associated with swallowing problems (e.g., coughing, choking, spitting of food, drooling, difficulty handling oral secretions, double swallowing or major delay in swallowing, watering eyes, nasal discharge, wet or gurgly voice, decreased ability to move tongue and lips, decreased mastication of food, decreased ability to move food to the back of the pharynx, slow or scanning speech). These are all signs of swallowing impairment. Assess ability to swallow a small amount of water. If aspirated, little or no harm to the patient occurs. Check for residual food in mouth after eating. Pocketed food may be easily aspirated at a later time. Check for food or fluid regurgitation through the nares. Regurgitation indicated decreased ability to swallow food or fluids and an increased risk for aspiration. Evaluate the results of swallowing studies as ordered. A video-fluoroscopic swallowing study may be indicated to determine the nature and extent of any oropharyngeal swallowing abnormality, which aids in designing interventions. Determine patient’s readiness to eat. Patient needs to be alert, able to follow instructions, hold head erect, and able to move tongue in mouth. If one of these factors is missing, it may be desirable to withhold oral feeding and do enteral feeding for nourishment. Cognitive deficits can result in aspiration even if able to swallow adequately. Before mealtime, provide for adequate rest periods. Fatigue can further add to swallowing impairment. Eliminate any environmental stimuli (e.g., TV, radio) The patient can more concentrate when external stimuli are removed. Provide oral care before feeding. Clean and insert dentures before each meal. Optimal oral care promotes appetite and eating. If patient has impaired swallowing, consult a speech pathologist for bedside evaluation as soon as possible. Ensure that patient is seen by a speech pathologist within 72 hours after admission if patient has had a CVA. Speech pathologists specialize in impaired swallowing. Early referral of CVA patients to a speech pathologist, along with early initiation of nutritional support, results in decreased length of hospital stay, shortened recovery time, and reduced overall health costs. For impaired swallowing, use a dysphagia team composed of a rehabilitation nurse, speech pathologist, dietitian, physician, and radiologist who work together. The dysphagia team can help the patient learn to swallow safely and maintain a good nutritional status. Place suction equipment at the bedside, and suction as needed. With impaired swallowing reflexes, secretions can rapidly accumulate in the posterior pharynx and upper trachea, increasing the risk of aspiration. If patient has impaired swallowing, do not feed until an appropriate diagnostic workup is completed. Ensure proper nutrition by consulting with physician for enteral feedings, preferably a PEG tube in most cases. Feeding a patient who cannot sufficiently swallow results in aspiration and possibly death. Enteral feedings via PEG tube are generally preferable to nasogastric tube feedings because studies have shown that there is increased nutritional status and possibly improved survival rates. Before feeding, provide the patient a lemon wedge, pickle, or tart-flavored hard candy. Moistening and use of tart flavors stimulate salivation, lubricate food, and improves the ability to swallow. Position patient upright at a 90-degree angle with the head flexed forward at a 45-degree angle. This position allows the trachea to close and esophagus to open, which makes swallowing easier and reduces the risk of aspiration. Ensure patient is awake, alert, and able to follow sequenced directions before attempting to feed. As the patient becomes less alert the swallowing response decreases, which increases the risk of aspiration. Begin by feeding patient one-third teaspoon of applesauce. Provide sufficient time to masticate and swallow. Gravy or sauce added to dry foods facilitates swallowing. Place food on unaffected side of tongue. During feeding, give patient specific directions (e.g., “Open your mouth, chew the food completely, and when you are ready, tuck your chin to your chest and swallow”). Proper instruction and focused concentration on specific steps reduce risks. Maintain the patient in high-Fowler’s position with the head flexed slightly forward during meals. Aspiration is less likely to happen in this position. Instruct the patient not to talk while eating. Provide verbal cueing as needed. Concentration must be focus on the task. Observe for uncoordinated chewing or swallowing; coughing shortly after eating or delayed coughing, which may mean silent aspiration; pocketing of food; wet-sounding voice; sneezing when eating; delay of more than 1 second in swallowing; or a variation in respiratory patterns. If any of these signs are present, put on gloves, eliminate all food from oral cavity, end feedings, and consult with a speech and language pathologist and a dysphagia team. These are signs of impaired swallowing and possible aspiration. Reassure the patient to chew completely, eat gently, and swallow frequently, especially if extra saliva is produced. Give the patient with direction or reinforcement until he or she has swallowed each mouthful. Such directions assist in keeping one’s focus on the task. Classify food given to the patient before each spoonful if the patient is being fed. Knowledge of the consistency of food to expect can prepare the patient for appropriate chewing and swallowing technique. Advance slowly, giving small amounts; whenever possible, alternate servings of liquids and solids. This technique helps prevent foods from being left in the mouth. Encourage high-calorie diet that involves all food groups, as appropriate. Avoid milk and milk products. Dairy products can lead to thickened secretions. If patients pouch food to one side of their mouth, encourage them to turn their head to the unaffected side and manipulate the tongue to the paralyzed side. Foods placed on the unaffected side of the mouth promote more complete chewing and movement of food to the back of the mouth, where it can be swallowed. These strategies aid in cleaning out residual food. If patient tolerates single-textured foods such as pudding, hot cereal, or strained baby food, advance to a soft diet with guidance from the dysphagia team. Avoid foods such as hamburgers, corn, and pastas that are difficult to chew. Also, avoid sticky foods such as peanut butter and white bread. The dysphagia team should determine the appropriate diet for the patient on the basis of progression in swallowing and ensuring that the patient is nourished and hydrated. If the patient had a stroke, place food in the back of the mouth, on the unaffected side, and gently massage the unaffected side of the throat. Massage aids stimulate the act of swallowing. Place whole or crushed pills in custard or gelatin. (First, ask a pharmacist which pills should not be crushed.) Substitute medication in an elixir form as indicated. Mixing some pills with foods helps reduce the risk for aspiration. Encourage the patient to feed self as soon as possible. With self-feeding, the patient can establish the volume of a food bolus and the timing of each bite to promote effective swallowing. If oral intake is not possible or in inadequate, initiate alternative feedings (e.g., nasogastric feedings, gastrostomy feedings, or hyperalimentation). Optimal nutrition is a patient need. For many adult patients, avoid using straws if recommended by speech pathologist. Use of straws can increase the risk of aspiration because straws can result in spilling of a bolus of fluid in the oral cavity as well as decrease control of posterior transit of fluid to the pharynx. Praise patient for successfully following directions and swallowing appropriately. Praise reinforces behavior and sets up a positive atmosphere in which learning takes place. Initiate a dietary consultation for calorie count and food preferences. Dietitians have a greater understanding of the nutritional value of foods and may be helpful in guiding treatment. Keep patient in an upright position for 30 to 45 minutes after a meal. An upright position guarantees that food stays in the stomach until it has emptied and decreases the chance of aspiration following meals. Observe for signs of aspiration and pneumonia. Auscultate lung sounds after feeding. Note new crackles or wheezing, and note elevated temperature. Notify physician as needed. The presence of new crackles or wheezing, an elevated temperature or white blood cell count, and a change in sputum could indicate aspiration of food. Both the patient and caregiver may need to be active participants in implementing the treatment plan to optimize safe nutritional intake. Weigh patient weekly. This is to help evaluate nutritional status. Assess nutritional status regularly. If not adequately nourished, work with dysphagia team to determine whether patient needs to avoid oral intake (NPO) with therapeutic feeding only or needs enteral feedings until patient can swallow adequately. Enteral feedings can maintain nutrition if patient is unable to swallow adequate amounts of food. Discuss the importance of exercise to enhance the muscular strength of the face and tongue to enhance swallowing. Muscle strengthening can facilitate greater chewing ability and positioning of food in the mouth. Educate patient, family, and all caregivers about rationales for food consistency and choices. It is common for family members to disregard necessary dietary restrictions and give patient inappropriate foods that predispose to aspiration.